What is ZO Ossential Growth Factor Serum Plus? ZO Ossential Growth Factor Serum Plus is a facial anti-ageing serum that is manufactured by ZO Skin Health, Inc. This serum is suitable for all skin types. The serum contains components such as retinol, beta glucan, herbal extracts, and plant stem cells. This lightweight gel works to help the skin repair itself and to protect against signs of ageing. As well, the gel helps to strengthen the skin. In the package you can find a jar containing 3mL of the anti-ageing serum. The product must be stored 15 and 30°C away from direct sunlight. ZO Ossential Growth Factor Serum Plus is a great solution for patients of all skin types, even for patients with sensitive skin. This specially designed anti-ageing formula will help reduce the appearance of fine lines and wrinkles in patients. Recommend this anti-ageing serum to patients with dry skin and fine lines. Evens the skin tone and promotes a brighter complexion. This facial serum, thanks to its potent ingredients provides patients with a more youthful and healthy complexion. How does this anti-ageing serum work? This anti-ageing serum contains dipeptide diaminobutyroyl benzylamide diacetate, which is a synthetic neuro peptide. Many studies have shown that this neuro peptide blocks acetylcholine receptors; thus, keeping the muscles relaxed. This process helps diminish the appearance of fine lines and wrinkles on the patient’s skin’s surface, which are caused particularly by movement of the muscles. The retinol contained in the serum helps to strengthen and firm the skin and even the skin tone by stimulating collagen production within the skin. Another active component in this serum is ZPRO, which works by reducing the signs of ageing. Buddleja stem cells also prevent future ageing signs from appearing. As well, the fermented red ginseng extract and the disodium acetyl glucosamine phosphate restore moisture, firmness, and elasticity to the skin. Other components of the serum, such as beta glucan, help to soothe and calm irritated skin. How often should ZO Ossential Growth Factor Serum Plus be used? Advise your patients to use this anti-ageing serum once a day, 30 minutes before bedtime. Before use, the patients should thoroughly clean and dry their skin. Once the face is cleansed and dried, the patient should apply 1 to 2 pumps of serum evenly over the face and neck. While applying, they must avoid their eyes. Patients should thoroughly rinse the eyes with water if the serum gets in the eye. ZO Ossential Growth Factor Serum Plus can be used with other ZO skincare products for a complete skincare routine that is tailored to their needs. Zo Ossential Growth Factor Serum Plus is considered to be a safe and effective facial serum. Advise your patients to avoid using this serum if they have any known allergies or hypersensitivity to any of its components. This serum must be used with caution during breastfeeding period and pregnancy. Patients should limit sun exposure when using this serum and use adequate sun protection. Zo Ossential Growth Factor Serum Plus is for external use only. Severe side effects have not been reported when using this facial serum; however, some minor side effects may occur following the initial use of the serum. These common side effects are mild and usually resolve on their own in a short period of time. If skin irritation or rash occurs and persists, advise your patient to stop using this serum until the effects resolve completely. Advise your patients to seek immediate medical assistance if they experience an allergic reaction following the use of this anti-ageing serum. This anti-ageing serum is made of retinol, beta glucan, fermented red ginseng extract, and several other potent anti-ageing ingredients. Retinol promotes renewal of the epidermis and collagen growth for a brighter and firmer skin tone. Fermented red ginseng extract and disodium acetyl glucosamine phosphate stimulate cellular growth that increases the elasticity and firmness of the skin. Dipeptide diaminobutyroyl benzylamide diacetate is a peptide that reduces the appearance of fine lines and wrinkles. ZPRO protects the skin from cellular damage. Buddleja stem cells prevent future damage and ageing signs. Beta glucan soothes and calms irritated skin. All these components combined work together in order to provide patients with a firmer and brighter complexion. 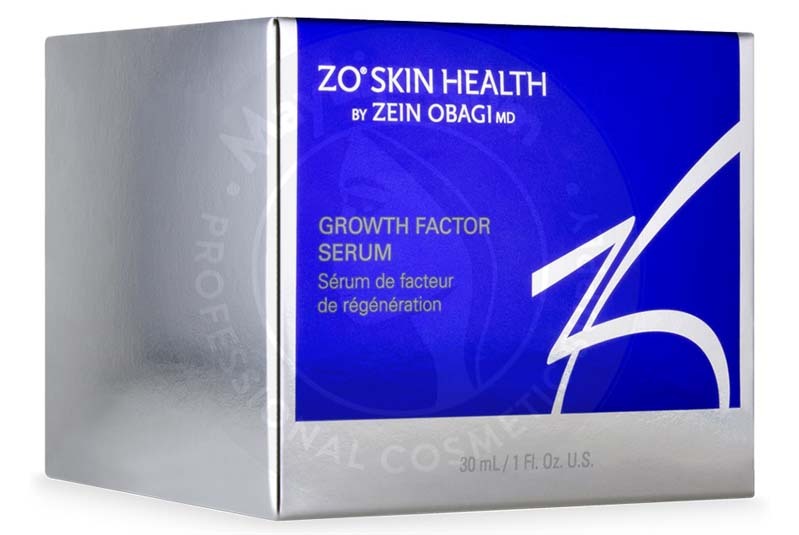 Name: ZO® OSSENTIAL® GROWTH FACTOR SERUM PLUS. 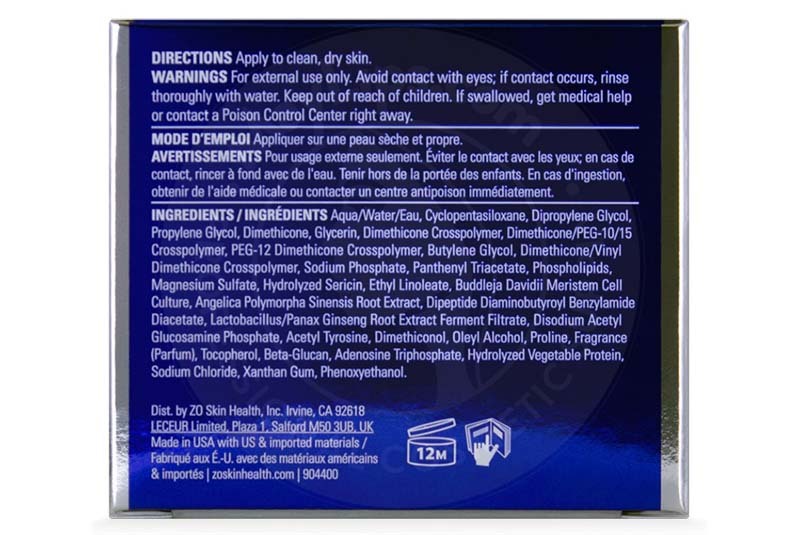 Ingredients: Cyclopentasiloxane, Water (Aqua), Dipropylene Glycol, Propylene Glycol, Glycerin, Dimethicone, Dimethicone/PEG-10/15 Crosspolymer, Dimethicone Crosspolymer, PEG-12 Dimethicone Crosspolymer, Butylene Glycol, Phenoxyethanol, Panthenyl Triacetate, Acetyl Tyrosine, Phospholipids, Ethyl Linoleate, Sodium Phosphate, Dimethicone/Vinyl Dimethicone Crosspolymer, Fragrance (Parfum), Hydrolyzed Sericin, Magnesium Sulfate, Proline, Oleyl Alcohol, Polysorbate 20, Retinol, Buddleja Davidii Meristem Cell Culture, Menthyl Ethylamido Oxalate, Angelica Polymorpha Sinensis Root Extract, Hydrolyzed Vegetable Protein, Adenosine Triphosphate, Dimethiconol, Dipropylene Glycol, 1,2-Hexanediol, Pentylene Glycol, PEG-35 Castor Oil, PEG-12 Glyceryl Laurate, Lactobacillus/Panax Ginseng Root Extract Ferment Filtrate, Tocopherol, Sodium Citrate, Disodium Acetyl Glucosamine Phosphate, Caprylyl Glycol, Beta-Glucan, Dipeptide Diaminobutyroyl Benzylamide Diacetate, BHT, Sodium Chloride, Potassium Sorbate, Hexylene Glycol, Xanthan Gum, PVP, Disodium EDTA, BHA, Limonene, Linalool, Citral, Citronellol. Size: Jar, 30 ml (1.0 fl oz).